In our special feature two weeks ago, we noted the importance of cross-border trade between Mexico and the United States. Mexico’s top trading partner is the United States. The United States’ second-largest trading partner is Mexico (Canada occupies the top spot). The U.S. upstream industry suffered during the oil price war, but it is now rebounding. Mexico’s oil industry has stagnated. The government is opening up the industry to attract private investment to revivify the oil sector, but this process will take some time. 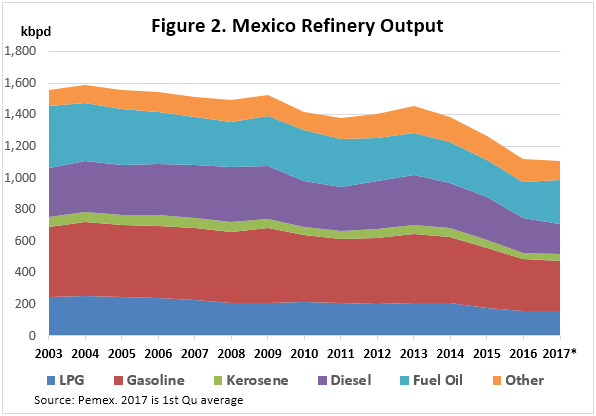 In this briefing, we examine refined product output in Mexico, and the rise in fuel imports from the United States. Mexico’s downstream sector has fallen behind in terms of investment and sophistication. The country passed several laws to tighten petroleum product specifications, and Pemex made ambitious plans for refinery expansion and modernization. Yet these plans have been delayed and revised several times. A new refinery was planned at Tula, for example, but the plan was downgraded into an expansion at the existing refinery. Total refinery capacity has been flat at around 1.6 mmbpd for several years, and throughput has fallen. 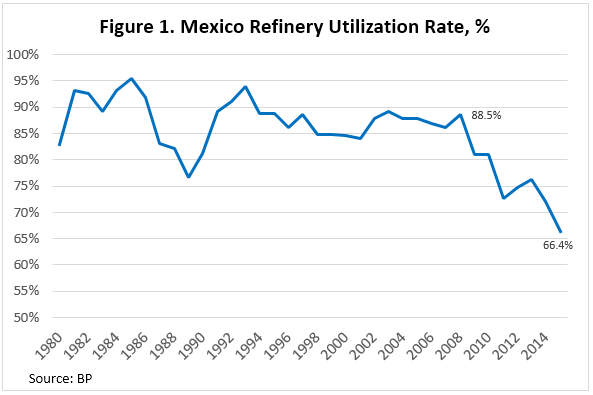 As Figure 1 illustrates, Mexico’s refinery utilization rate fell from 88.5% in 2008 to 66.4% in 2015, according to data published by British Petroleum (BP). Mexico’s production of refined fuels has declined significantly. Figure 2 presents the trend in refinery output. In 2003, output was 1,556 kbpd. It fell to 1,108 kbpd during the first quarter of 2017. Between 2003 and 2016, output declined at a rate of 2.5% on average per year. Between 2012 and the first quarter of 2017, gasoline production dropped by approximately 103 kbpd, and diesel output dropped by 111 kbpd. Mexico’s output pattern also contains a high percentage of low-value fuel oil, approximately 20.4% in 2016 and 25% during the first quarter of 2017. Gasoline output is 28.5%, and diesel output is 17%. For purposes of comparison, U.S. refinery output in 2016 was 47% gasoline, 28.4% diesel, and only 2.5% residual fuel oil—an extremely high-value pattern of output. With Mexico’s refinery output languishing, and U.S. output booming, it is not surprising that U.S. exports to Mexico have grown. 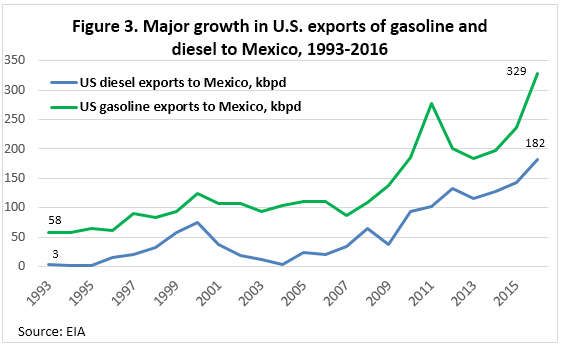 Figure 3 illustrates the major growth in U.S. exports of gasoline and diesel to Mexico between 1993 and 2016. In 1993, the U.S. exported 58 kbpd of gasoline to Mexico. In 2016, this had grown to 329 kbpd. The increase in diesel exports to Mexico skyrocketed from a mere 3 kbpd in 1993 to 182 kbpd in 2016. The upside of a state-controlled price is that the Mexican consumer can be spared price volatility. However, the Mexican public recently has been paying a good deal more than the average U.S. consumer. 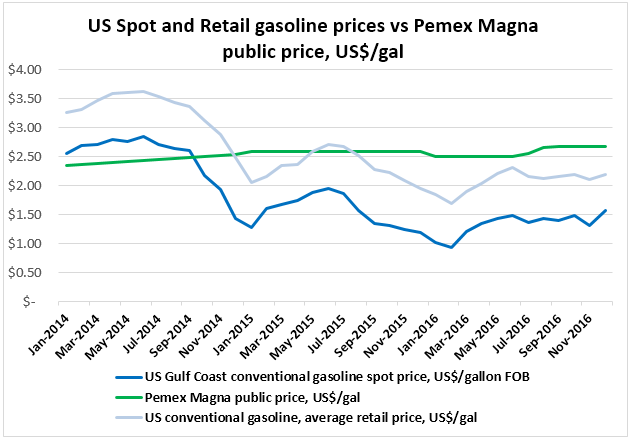 In 2014, Pemex Magna gasoline was 5 cents/gallon less than the U.S. Gulf Coast spot price, and 86 cents/gallon below the average U.S. retail price. In 2015, the price differential switched. Pemex Magna was $1.03/gallon more expensive than U.S. Gulf Coast spot gasoline, and $0.26/gallon more expensive that the U.S. average retail price. This price differential widened further in 2016, with Pemex Magna priced $1.24/gallon higher than the U.S. Gulf Coast spot price and $0.50/gallon higher than the U.S. average retail price. As noted in our feature two weeks ago comparing Mexican and U.S crude production, Mexico’s oil industry has not thrived as a state-run monopoly. The government is taking steps to open the market to competition. On the upstream side, the timing has complicated matters, since global oversupply has weakened prices and pushed back many investments in crude exploration and development. On the downstream side, Mexico’s refineries have fallen behind in sophistication and competitiveness. Mexico has imported a growing share of its gasoline and diesel from the United States, where spot prices have been more than a dollar a gallon cheaper than Mexico’s state-controlled price. A number of foreign firms have shown interest in participating in Mexico’s downstream sector, but many are finding it a challenge to do business there. For example, fuel distribution by private truck to service stations has been allowed by law as of April 3rd, but non-Pemex tanker trucks are being blocked. Union pressure has kept gasoline and diesel transport under the control of Pemex trucks and union labor. Moreover, in our article on the upstream sector two weeks ago, we noted problems with fuel theft. Pemex has reported literally thousands of illegal taps into pipelines. Recently, the head of Pemex stated that the thefts were the responsibility of drug cartels, and admitted that some Pemex employees have been colluding with the gangs. Clearly, there are opportunities for foreign firms to participate in Mexico’s oil sector, but the process of opening the market and enforcing the laws will take time.